Play Legend of the Green Dragon or other free online games. You too can earn money from writing articles by signing up for InfoBarrel. What are MUDs, MMOs and MMORPGs? Ever since the Internet was first created, and predating the creation of the World Wide Web by some years, online games have been played on it. Games of all types are played, from computer variants of traditional boardgames such as Chess to much more complex games. As well as being able to play games by yourself, or one on one, there are those that allow you to play in the same world as other people. As well as playing in the same world, you can play with sometimes tens or even hundreds of thousands of other people, at the same time. Much of the influence on computer games of this type has come from the traditional pen, paper and dice role-playing games. Credit: http://en.wikipedia.org/wiki/File:ADVENT_--_Crowther_Woods.pngThe earliest adventure game was Adventure, or Colossal Cave Adventure, created by Will Crowther in 1974. Inspired by this, Zork was written and was played on the ARPANET (the precursor to the Internet). This was then ported into FORTRAN as the game Dungeon. Credit: http://en.wikipedia.org/wiki/File:MUD1_screenshot.gifMUDs are Multi-User Dungeons, featuring a multiplayer real time online world, and were the precursors to modern MMORPGs. Usually textual, they originated in the 1970s, and were often played in a fantasy, swords and sorcery setting. Traditional pen, paper and dice Role Playing Games like Dungeons & Dragons were a big influence on these games. MUD settings, like their role playing game inspirations, were not limited to fantasy, though, and games would be based on other genres, as well as being based on books, television and films. Players would move around the virtual world, interacting with other, real, players through their characters, as well as objects, settings and non-player character (NPCs), typically run by the software. The term MUD was coined by Roy Trubshaw, a student at Essex University in the UK, who created a multi-user game in MACRO-10 (an assembly language) for a DEC PDP-10 which he called MUD, or Multi-User Dungeon, in tribute to Dungeon, a variant of Zork. The first MUD was actually called MUD. These were traditional MUD games that incorporated graphics, and are what evolved into the genre now known as MMORPGs. MMOs are Massively Multiplayer Online games. Both MUDs and MMORPGs are types of MMOs, although the MUD and the MMORPG were the first of this type and effectively created the genre. MMORPGs are Massively-Multiplayer Online Role Playing Games. They were originally called Graphical MUDs, but changed later to the name by which they are now known. MMORPGs have evolved from the original MUDs to Graphical MUDs to 3D graphical worlds and are still evolving. RuneScape, one of the cheapest MMORPGs around to play - excluding those that are completely free of course, and RuneScape itself has a free option - has evolved tremendously since its initial release. RuneScape is considered to be a second generation MMORPG, following on from first generation ones like Ultima Online, which game saw the first use of the term MMORPG to describe the game by the game's creator, Richard Garriott. Island of Kesmai is credited with being the first MMORPG. It was one of the earliest commercial games, released in 1985, and used Roguelike graphics (named after the genre of single-player adventure games, with either ASCII or 2D graphics, started by the game Rogue in 1980), and could be played on CompuServe with no extra charge than that of using CompuServe itself. Which was, admittedly, quite substantial. Of course, back in 1985 the definition of "massive" when it came to online games was substantially smaller than it is today. Neverwinter Nights is credited with being the first graphical online multiplayer game and was released in 1991. This game was not merely based on Dungeons & Dragons, it was an actual (Advanced) Dungeons & Dragons game, released by the same company behind the original D&D and AD&D games. It was played on America Online (AOL). Meridian 59 was released in September 1996, and is credited with being the first 3D Massively Multiplayer Online game, as well as being the first to have the now common monthly subscription model, as opposed to paying by the hour. 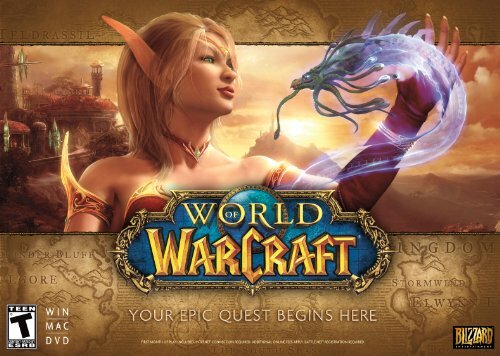 Credit: http://en.wikipedia.org/wiki/File:WoW_Box_Art1.jpgThe current, or third generation of MMORPGs, was considered to have started with the launch of Blizzard's World of Warcraft and Sony's EverQuest II. World of Warcraft is in the dominant online position that its pen and paper predecessor, Dungeons & Dragons occupies in the tabletop market, both having a market share of over 50%. Third generation games are usually 3D first person viewpoint, where you are effectively looking through the eyes of your character. Second generation MMORPGs more often have you looking down (or around; camera angles can be changed) on your character. The market for MMORPGs is constantly growing, with the biggest, World of Warcraft, reaching well into the mainstream. Online worlds based on commercial properties, such as Lord of the Rings or Star Wars, are increasingly common. Desktop computers (and earlier mainframes) were the traditional market and starting point for these games, they are now crossing to new platforms. Although MMOs started off in the desktop computer market, they have also moved into the console market. Early, primarily textual games, would not have been easy to play on consoles, but as the technology has advanced, the ability to play them on a console has increased. The first console game released, in a limited form, was Phantasy Star Online in 2001, although it wasn't until Final Fantasy XI was released that console MMORPGs became truly comparable to desktop games. The increase in smartphones and tablet computers has increased the ease with which online worlds can be accessed. Now, with the right app, or simply in the devices' web browser, you can play an online game at any time. These games are currently limited to those at the lower end; mobile devices currently simply do not have the power to play things like World of Warcraft, nor do they have the screen size to make playing such enjoyable. As mobile technology improves, they are going to be truly playable everywhere. Although cross-platform worlds are currently rare, it is likely that, as technology improves, you will be able to play the same game in the same virtual world no matter what you are using, whether desktop, tablet, smartphone, console, television or some technology not yet created.